A network of commitment dedicated to California’s manufacturing success. Choose a Region on the map to see our service partners who operate there. As a non-profit organization, CMTC’s mission is to serve as a trusted advisor to manufacturers providing solutions which will grow both their businesses and the California economy. To help fulfill this role we have compiled a list of state and federal agencies with programs and services to assist manufacturers. 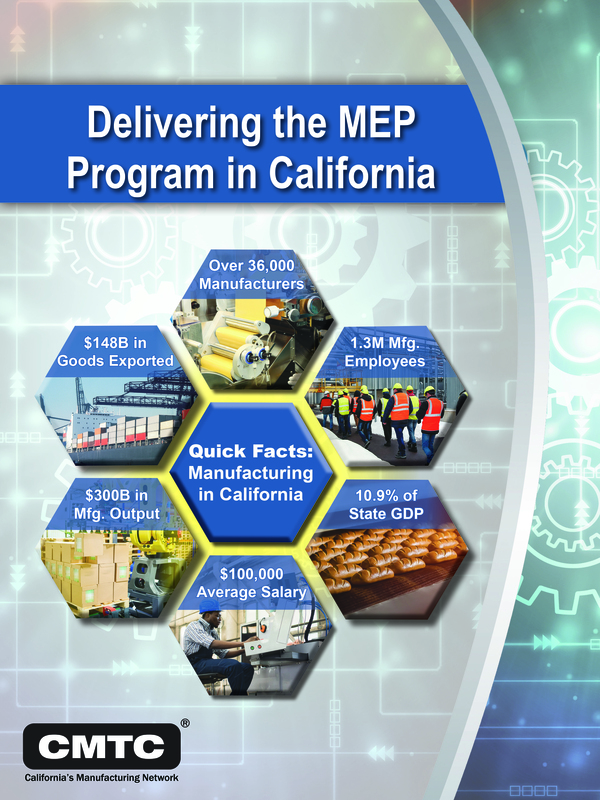 During the first year of CMTC's five year award to be California's Manufacturing Extension Partnership Center, we have made great progress in building a statewide network to serve Small and Medium-Sized Manufacturers (SMMs). The Los Angeles County Economic Development corporation's Institute for Applied Economics used independent third party project survey data to determine the economic impact of CMTC's work with clients on California's economy. This impact can be attributed to the hard work of the CMTC Team and our partners in California's Manufacturing Network. The CMTC® mission is to ensure that manufacturers flourish by identifying areas of improvement in capability process and systems to create financial impact. California manufacturers are important contributors to innovation, investment and productivity in the U.S. Our success stories (available on the left) outline specific project impacts by industry sector and service. CMTC is part of the U.S. Department of Commerce Hollings Manufacturing Extension Partnership (MEP) Program that ensures our high customer satisfaction ratings. All customers are surveyed by an independent third-party to verify that we have delivered impact to our clients. CMTC provided solutions to improve the growth and profitability of more than 1,100 small and medium-sized manufacturers in 2018. Biocom is the largest, most experienced advocate for California’s life science sector, working on behalf of more than 900 members to drive public policy, accelerate the innovation ecosystem and introduce inventive purchasing programs. Biocom Institute is the the non-profit workforce development and science, technology, engineering and math (STEM) arm of Biocom. Butte Community College's The Training Place was established to deliver affordable training and workshops designed to help businesses of all kinds, including manufacturing, achieve sustainable growth. As Northern California continues to grow demographically and economically, the Center for Economic Development (CED) at CSU, Chico is committed to helping communities prepare and plan for future growth. Helping communities and businesses in planning, community development, employment generation, natural resource management, workforce development, alternative energy advancement, and leadership training is the CED’s goal. 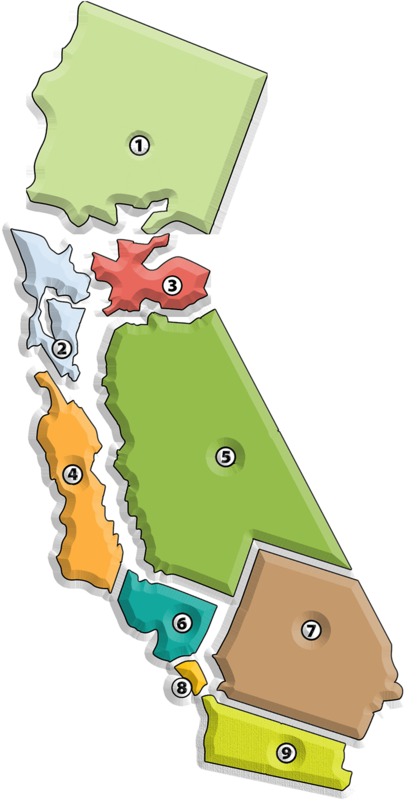 Additionally, CED provides services to emerging and existing manufacturers in California. Specifically, CED engages with North State food and beverage manufacturers to provide one-on-one technical assistance in the areas of food safety regulatory compliance, targeted marketing assistance, and loan preparation services. The El Camino College Business Training Center (BTC) provides an immediate impact on businesses both large and small by delivering high-quality training and assistance designed to create a more productive and competitive workforce. Los Angeles County Economic Development Corporation (LAEDC) is part of a statewide network of economic development agencies which provide business assistance and attraction programs, economic research, economic and policy analysis, and public policy leadership; and is considered an expert in economic and business development that can directly benefit manufacturers. LAEDC’s services include technical assistance, location and relocation services, educational workshops, as well as information regarding state tax credit programs and other resources available to businesses. The Northern Rural Training and Employment Consortium (NoRTEC) is a consortium of 11 Northern California Counties established to address the needs of job seekers and businesses in the region which supports a diverse economy, including manufacturing and agriculture. NoRTEC is the host organization for the Grow Manufacturing Initiative (GMI) and together they work to build a stronger manufacturing sector through alignment of industry needs with education and workforce strategies. GMI assists emerging and existing manufacturers by providing information & referrals to resources, supporting networking events and organizing the annual North State Manufacturing Expo. GMI also coordinates with educators to train teachers on current technology, contributes to the development of curriculum for 8th – 12th grade students and organizes student tours of manufacturing plants. The Economic Development and Corporate Training division (EDCT) of San Bernardino Community College District partners with organizations within the Inland Empire to improve workforce development and economic development. In 1993, a small group of business leaders came together to apply their entrepreneurial spirit to critical issues affecting Fresno, and the Fresno Business Council was born. The FBC has been and continues to be a key collaborating organization with scores of local, regional and state entities which are focusing efforts on creating economic prosperity for individuals and businesses in the state. Fresno Business Council is the host organization for the San Joaquin Valley Manufacturing Alliance (SJVMA) and together they work to build a stronger manufacturing sector through alignment of industry needs with education and workforce strategies. SJVMA works closely with business organizations, educational institutions, government and manufacturing companies to build a globally competitive workforce, create manufacturing excellence in the region, positively impact all levels of education and be an advocate for manufacturing in the region. SJMA provides information, resources; conducts meetings; organizes an annual manufacturing summit; connects employers with contract education training, and actively supports the growth of internships and apprenticeship programs. Manex delivers high-impact solutions in four key areas—strategy, people, process and performance—to help manufacturers, distributors and their supply chains quickly achieve cost efficiencies and increased profits. The primary focus of the Professional Development Center (PDC) of Glendale Community College is to expand on the college’s mission by investing in State of California’s economic growth and helping improve employees’ job skills by means of providing customized courses and training. PDC is committed to the success of businesses it serves and provides support through premier business and industry-specific training, workforce development and contributing to a highly skilled and productive workforce in the region. Valley Vision was formed in 1994 with a purpose to make the surrounding communities the most livable in the nation. In support of this, Valley Vision focuses on six strategic goals, including a 21st Century Workforce Strategy to meet employer needs and provide workers pathways to high-quality jobs through skills-building, and an Innovation and Entrepreneurship Strategy to support emerging and existing businesses as they are a key source for economic diversification and regional growth. Valley Vision is responsible for the organization of the Sacramento Valley Manufacturing Initiative (SVMI). SVMI is committed to working with educators and industry partners to proactively develop vocational, educational and workforce initiatives and programs leading to fulfilling manufacturing career paths for our region’s students and workforce. SVMI efforts are to ensure that the Sacramento area is viewed as a region of manufacturing excellence with a globally competitive manufacturing sector and a solid pipeline of skilled workers. Sierra College’s Training and Development department delivers customized workforce development solutions to manufacturers throughout Northern California, and actively collaborates with regional key organizations to improve and grow the manufacturing ecosystem. In 2017 Sierra College opened the GENE HAAS CENTER for Advanced Manufacturing by Design, a state-of-the-art machining training center to expand the manufacturing program and offer training for businesses and students. The mission of Opportunity Stanislaus is to improve the economic vitality of Stanislaus County. To do this, Opportunity Stanislaus has identified four key initiatives to focus on: (1) Help existing businesses grow and thrive; (2) Establish a demand driven workforce readiness program which will enable companies to recruit and retain employees; (3) Create an effective messaging campaign promoting Stanislaus County as one of the “Best Places To Work In The Central Valley”; (4) Develop a culture of innovation and entrepreneurship. In 2017, the VOLT Institute was established. VOLT offers expedited, fast-paced training in high paying careers that are in demand.